All rooms have a private restroom and a private bath, but private bath is not hot spring except room of 【Type 2】. ※But we will keep your luggage before our check-in time and after check-out time. We have courtesy bus to Togetsutei from JR Saga-Arashiyama station. When you arrived at JR Saga-Arashiyama station, please call us. ※Out of service period : Saturday, Sunday and holyday of April, May and November etc. Dinner is served between 17:30 to 20:00. Breakfast is served between 7:30 to 8:30. ☆ Special room with private outdoor bath and indoor wood bath. ☆ 2persons 38,000yen ~ 45,000yen per/person. ☆ + tax 8% + tax 150yen per/person. ☆ 3persons 36,000yen ~ 43,000yen per/person. ☆ 4persons 35,000yen ~ 41,000yen per/person. ☆ 5persons 33,000yen ~ 40,000yen per/person. ☆ ※Those charges included the tax and the service charge. ☆ This room type is only 3rd floor. ☆ This room type has a great view. ☆ This room has highest grade Kaiseki and Japanese breakfast. ☆ This is our best room but it is far from public hot spring bath. ★ Special room with private hot spring bath of indoor. ★ 2persons 35,000yen ~ 44,000yen per/person. ★ + tax 8% + tax 150yen per/person. ★ 3persons 33,000yen ~ 42,000yen per/person. ★ 4persons 31,000yen ~ 40,000yen per/person. ★ 5persons 30,000yen ~ 39,000yen per/person. ★ ※Those charges included the tax and the service charge. ★ This room type is only 1st floor. ★ This room type has no view. ★ This room has higher grade Kaiseki and Japanese breakfast. 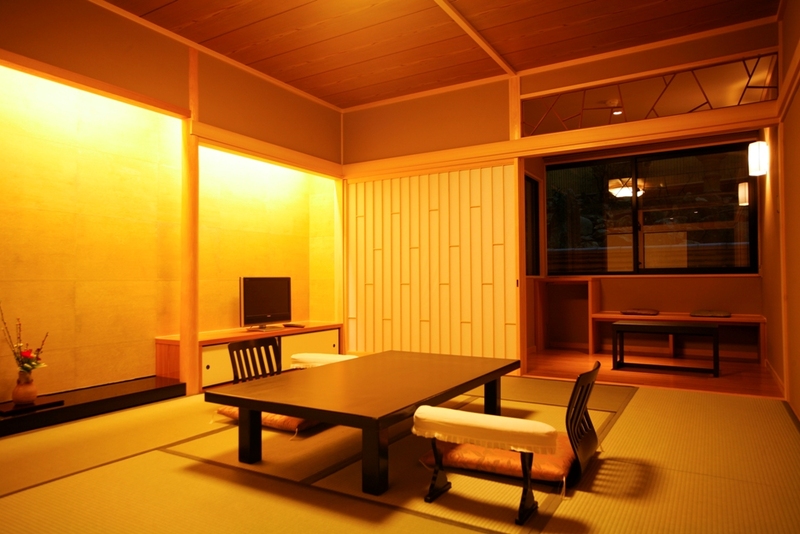 ★ This room is nearest public Onsen bath. ★ This room’s higher grade Kaiseki become highest grade Kaiseki. ★ Please try Kaiseki dinner of our pride. ○ Deluxe room with private bath of indoor. ○ 2persons 32,000yen ~ 40,000yen per/person. ○ + tax 8% + tax 150yen per/person. ○ 3persons 31,000yen ~ 38,000yen per/person. ○ 4persons 30,000yen ~ 36,000yen per/person. ○ 5persons 28,000yen ~ 35,000yen per/person. ○ 6persons 26,000yen ~ 33,000yen per/person. ○ ※Those charges included the tax and the service charge. ○ This room type is 2nd and 3rd floor. ○ This room type of 2nd floor has a good view. ○ This room type of 3rd floor has a great view. ○ This room has higher grade Kaiseki and Japanese breakfast. ○ This room is far from public Onsen bath. ○ This room’s higher grade Kaiseki become highest grade Kaiseki. ○ Please try Kaiseki dinner of our pride. ◇ Standard room with private small bath of indoor. ◇ 2persons 21,000yen ~ 30,000yen per/person. ◇ + tax 8% + tax 150yen per/person. ◇ 3persons 20,000yen ~ 26,000yen per/person. ◇ 4persons 19,000yen ~ 25,000yen per/person. ◇ ※Those charges included the tax and the service charge. ◇ This building has elevator. ◇ This room type is 2nd and 3rd floor. ◇ This room type has a normal view. ◇ This room has regular grade Kaiseki and Japanese breakfast. ◇ This room is near public Onsen bath. ◇ This room’s regular grade Kaiseki become higher grade Kaiseki. ◇ This room’s regular grade Kaiseki become highest grade Kaiseki. ◇ Please try Kaiseki Dinner of our pride. ◆ Standard room with private wood bath of indoor. ◆ 2persons 25,000yen ~ 34,000yen per/person. ◆ + tax 8% + tax 150yen per/person. ◆ 3persons 23,000yen ~ 32,000yen per/person. ◆ 4persons 22,000yen ~ 30,000yen per/person. ◆ ※Those charges included the tax and the service charge. ◆ This building has elevator. ◆ This room type is 2nd floor. ◆ This room type has a normal view. ◆ This room has regular grade Kaiseki and Japanese breakfast. ◆ This room is near public Onsen bath. ◆ This room’s regular grade Kaiseki become higher grade Kaiseki. ◆ This room’s regular grade Kaiseki become highest grade Kaiseki. ◆ Please try Kaiseki Dinner of our pride. ① Over 6 years old ~ under 12 years old. 1night 2meals (Child's Kaiseki dinner and Breakfast). ② Over 6 years old ~ under 12 years old. 1night 2meals (Child's Japanese dinner and Breakfast). ③ Over 3 years old ~ under 6 years old. ④ Over 3 years old ~ under 6 years old. ⑤ Over 3 years old ~ under 6 years old. ⑥ Over 3 years old ~ under 6 years old. ⑦ Under 3 years old. ※The amount of room rates changes by season and the day. ※Those charges included the tax and the service charge. If you need to cancel your reservation, please notify as soon as possible. 7days to 4days prior to the of your stay : 20% of total price. 3days to 1days prior to the of your stay : 50% of total price. Cancellation on the day you are to stay : 100% of total price. No notification of your cancellation : 100% of total price. About use of credit card. Diners Club International/UC/American Express/UFJ Card. We do not accept credit card payment for several things such as telephone charges, massage fee or home delivery cost.